I feel your pain. 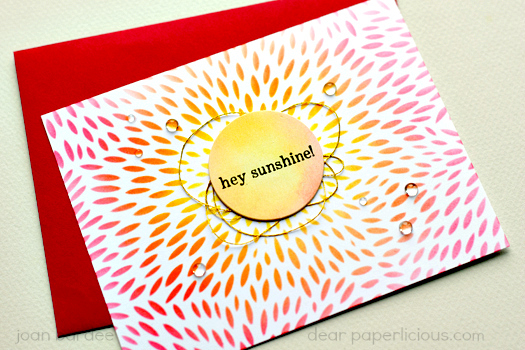 Everyone makes it look so easy, but as Leslie Hanna used to say, "Stamping is hard, people!" I miss her. That brand of metallic thread is a beast to work with. I got the kind Lara Bassen uses and it's so much easier! It's Coats & Clark and I can get the number of it for you, if you want. how do you know what brand I used?? Would love to know other thread that actually works. PS - your card is beautiful! Exactly what I thought when I read this - I LOVE Joan! yes, this is the story of me making cards, lol! ha, ha, ha! You nailed it, my friend! I keep the Toronto recycling people in business - for every card I post there are probably 6 or 7 in the bin! Hey, I just learned how to crochet by taking a class on Craftsy. It turned out to be amazingly easy! Love the card, super loved the commentary. I can totally relate, Joan, you just described me to a T! When things get crazy I always say to myself, hey, this is supposed to be FUN! I laughed so hard and so long over this! All the way through. It could have been me every moment of the way. It's sad, isn't it? Stamping is not always fun and easy. I'm so glad you told the real story because you're one who makes it look easy. I marvel at your CAS skills. In the end it turned out fabulous! If only the recipients of our cards new the agony we go through to send them fine art. After 25 years I have learned to accept the little imperfections. Hahaha! So funny and true! You nailed it! And your card is fabulous! Oh goodness. I needed that tonight! It was one of those, "everyone is perfect except me" nights. Thanks for being real!! This is why I don't make videos!! You always make me smile!! LOVE the colors on the stencil! You are just lovely; and your post is so very true! I literally BUSTED out laughing at your "real" version....PRICELESS! 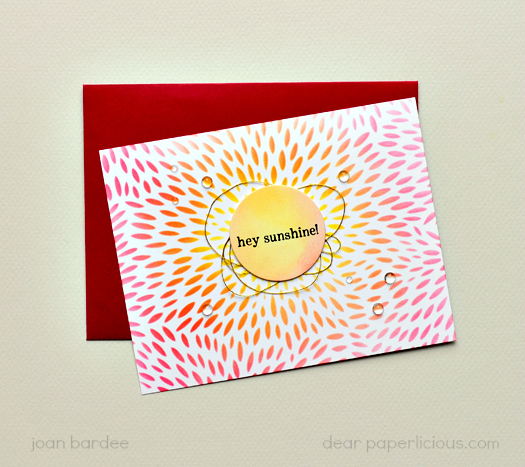 Love your finished card, Joan! And laughed out loud at the "real" timeline to get there! So true. I have the metallic thread, and have never taken the "messy nest" plunge. Dear paperlicious, it is nice to know I am not the only one! Sometimes, I have to set down something I started and leave it for a day for it to come together into something I actually like. I always save the parts that I attempted, because you never know when you might use them again on some other project. Frequently, I do find uses for them. I enjoyed your blog vs. real version. It made me laugh first thing in the morning to start my day, so thanks!!! Oh dear Joan, you are a treat! Loved this and it made me chuckle first thing this morning. I always feel like I am the SLOWEST card maker. Trying to come up with an idea and then actually putting it down. It's such a small piece of paper. How is it so hard and time consuming sometimes?!! Ha ha. But the joy of a wonderful finished card always brings happiness!!! Hugs!! priceless. I quit blogging a while back and now enjoy card-making a lot more...even the ones that I leave on my desk for days and stop to stare at when walking past in hopes of an AHA! moment. Sometimes that works. I really like your card! Thank you! Loved this post and related to every word. YES to all that! I've often thought when I post my supply lists, the longer list would be the supplies I tried and didn't use! Your finished card is lovely and will bring a smile to your friend, but I think you should share this post too, because as they say, "laughter is the best medicine." Thanks for a very funny slice of creative life! Thanks for the reality check! I feel so much better now. Oh I just burst out laughing reading this...it is SO me!! I thought I was the only one!! But my version is knitting, and I do already knit. When it takes me so long on a card, I figure I should just be knitting instead :)Thanks for making my day! Me too - laughed out loud at the end of your post! And I don't laugh very often! Thanks so much. I have a scrap of paper on my monitor that says, "It's only paper!" Not sure who said that first, but it helps me. P.S. Love the gold thread on your card, Joan. Oh so true. I'm so glad we stampers persevere through these trials, because our creations do bless those who receive them. Please continue sharing your thoughts and your creations for we are blessed by them. Finally! The real story comes out! This is soooo true. Love your blog & the final card is awesome! Thanks for sharing. LOL! That's exactly how I work - and those darn thread nests. Can't make those look decent. I'll teach you how to crochet. We could have a heck of a garage sale. Thanks for telling like it is (at least for me)!! Ha, Joan! You are loved by many and I appreciate you keeping it real. And in the end, I am sure your friend who had surgery appreciates your thoughtfulness. Heck, you thought about the card for nearly a week! Thanks for always sharing.